In a few weeks I’ll be doing a colors theme for storytime, and I thought it would be a good time to introduce my storytime kids to the idea of patterns. Right now I’m planning to keep the patterns simple with just the alternating colors, but if the kids seem to be catching on pretty quickly, I might switch it up a bit. 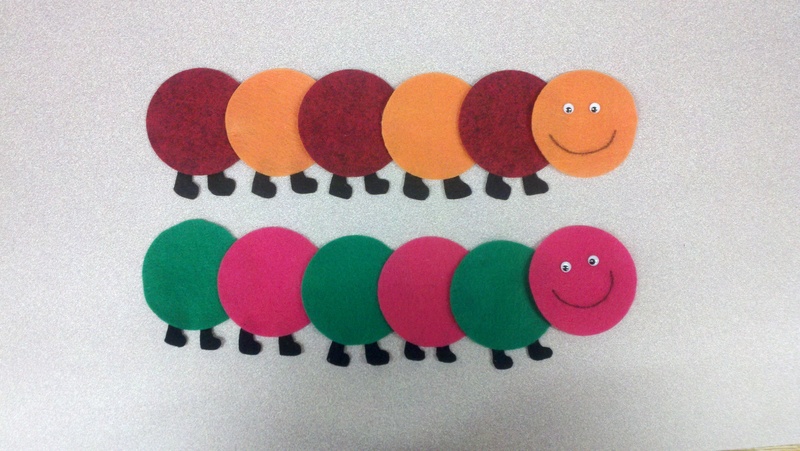 What I plan to do is tell the kids that we’re going to make some colorful caterpillars on the flannelboard. I’ll hold up one piece (say, a red one) and ask what color it is. Then I’ll hold up the next piece (an orange one) and ask what color that one is. I’ll keep up the trend until we get to the head, and then I’ll ask the kids, “And what color do you think Mr. Caterpillar’s head should be?” and see if they can guess the correct color based on the pattern. If they’re having some trouble, I’ll give them clues (“It’s the same color as Quacky’s beak.”). Sharon is hosting this week’s roundup over at ReadingChick. To visually browse past Flannel Fridays, head on over to the Flannel Friday Pinterest account. And to keep up with the Flannel Friday news, join the Flannel Friday Facebook Group!